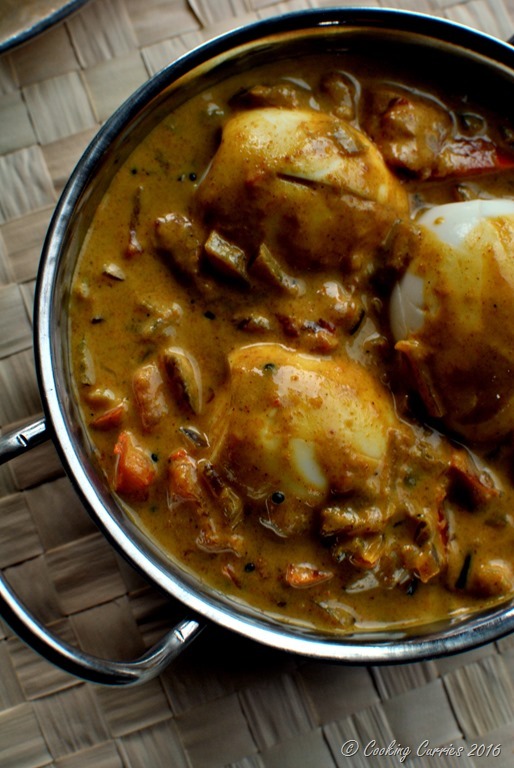 Spicy curry base that is finished with creamy coconut milk to balance out the spiciness is what makes this Kerala Style Egg Curry with Coconut Milk, so special. If you want to make it Vegan and skip the egg, you can just add a few other veggies like potatoes and carrots and it will still be just as good! Spicy egg curry with those lacey and crispy palappams are all that you need for a weekend breakfast. Why just weekends? Breakfast any day with this on the menu is going to be a good day! I can promise you that. 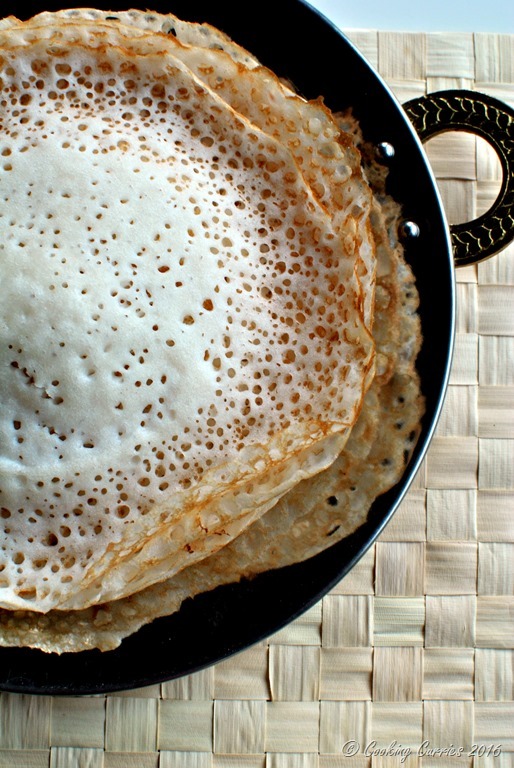 Palappams or appams are made with a rice batter with coconut milk that is fermented with yeast. The batter needs to made the previous day and let to ferment and rise overnight to get the bubbly lacey quality to it. There is a special pan that is used to make these, but you can make them in a regular skillet too, just like pancakes. If you have had the Ethiopian Injeera bread, then this comes close to it. I have to be honest here. I have never made appams from scratch. I make it from the appam mix, which is basically just rice flour. Even if it is a mix, there is still quite a bit of work that goes into the mixing of the rice flour with coconut milk and warm water and adding the yeast to it and letting it ferment and rise overnight and all that. But once you get a nice fermented batter, making appams is a breeze. Some of the meat eaters out there might argue that a chicken or a mutton curry might be the best combination for appams. But I know a few on the egg curry side of the camp as well. 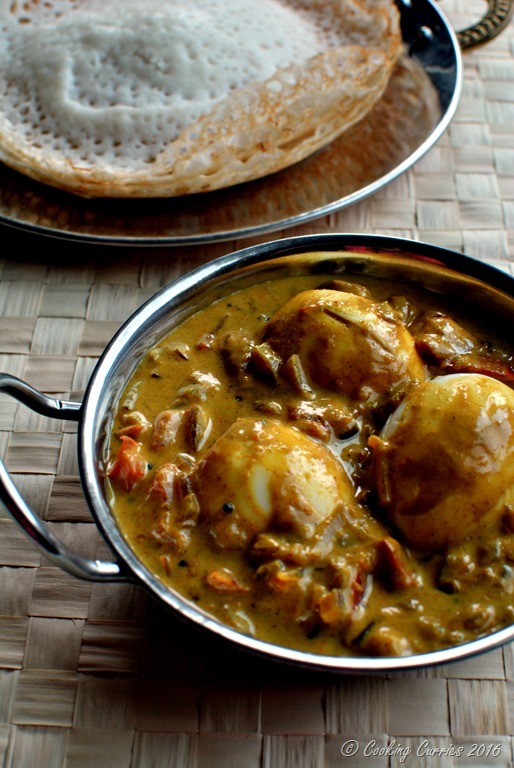 This egg curry made with coconut milk can be made for dinner to be eaten with rotis or rice as well. Hard boil the eggs, peel and keep aside. In a heavy bottomed pan, heat the oil and add the mustard seeds. Once they splutter, add the curry leaves. Add the chopped onions, ginger garlic paste and the green chillies. Sauté well for a couple of minutes till the onions turn slightly golden brown in color. Throw in the turmeric and garam masala powder and sauté well for a couple of minutes till the raw smell of turmeric disappears. Now add the tomatoes and sauté till they become soft. Add the salt and crushed black pepper and stir well. Lower the heat and add coconut milk. Once it starts to simmer, add the eggs to the curry. If you want you can make small slits in the eggs or cut them in half before you add them. Looks delicious! I love that you have described other options e.g. to make the curry vegan by omitting the egg and adding more veggies. Thanks! The recipe looks very interesting. I love your photos they are wonderfully taken. This sounds wonderful! I love curry! 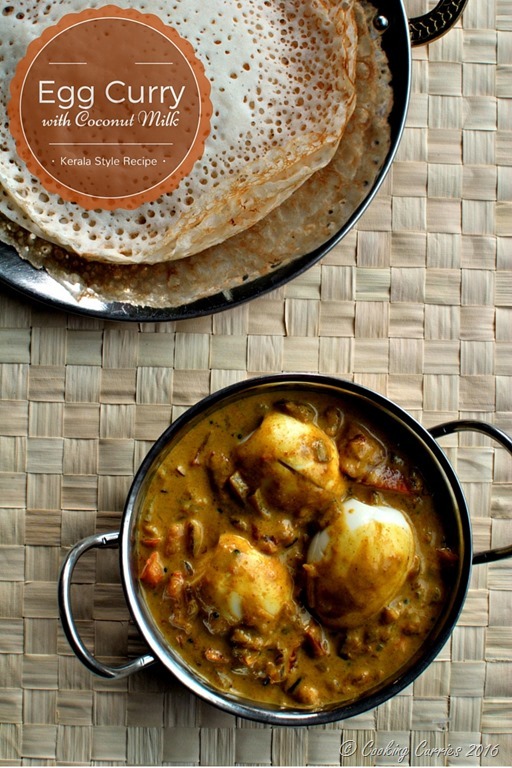 I have never had an egg curry, this sounds wonderful, especially with those bubbly, lacey appams, yum! I’m going to be sending this recipe to my Mother-In-Law, she knows how to cook good Indian for a Brit! Never herd of one like this. This meal looks so comforting and delicious. I love curry! Thank you!! You will love this, I hope you try it sometime! Sounds like a great comfort meal. A totally new dish to me. It is very comforting! One four favorites! I have always heard good things about Kerala’s curries. This is definitely very easy to make and your did a great job with the recipe. Thank you!! Some of the cleanest and simple but flavorful curries is what most of Kerala cuisine has – at least the vegetarian side of it! my fiancé would love this! This looks tasty and something I would really like to try! I’m sure you will love it. It’s a favorite here! I think I would use less chilies, as I’m not a huge fan of anything spicy, but this looks delish! Sure! It will still keep the flavors intact!